ICE models is the largest and longest standing model agency in South Africa with five divisions, three regional offices and one international office in Hamburg, Germany. We were commissioned to support the agency’s European expansion efforts by rebooting the branding, redesigning the web presence for all divisions, creating print promotional material, producing still and video content, and managing all Social Media platforms. First and most importantly, we shifted the brand visuals from an outdated dark gray to white. We flattened the blue dot (which represents an ice cube), made it bigger and moved closer to the E. We added region descriptors to the Durban and Johannesburg divisions and differentiated the Genetics and Kids divisions by color. 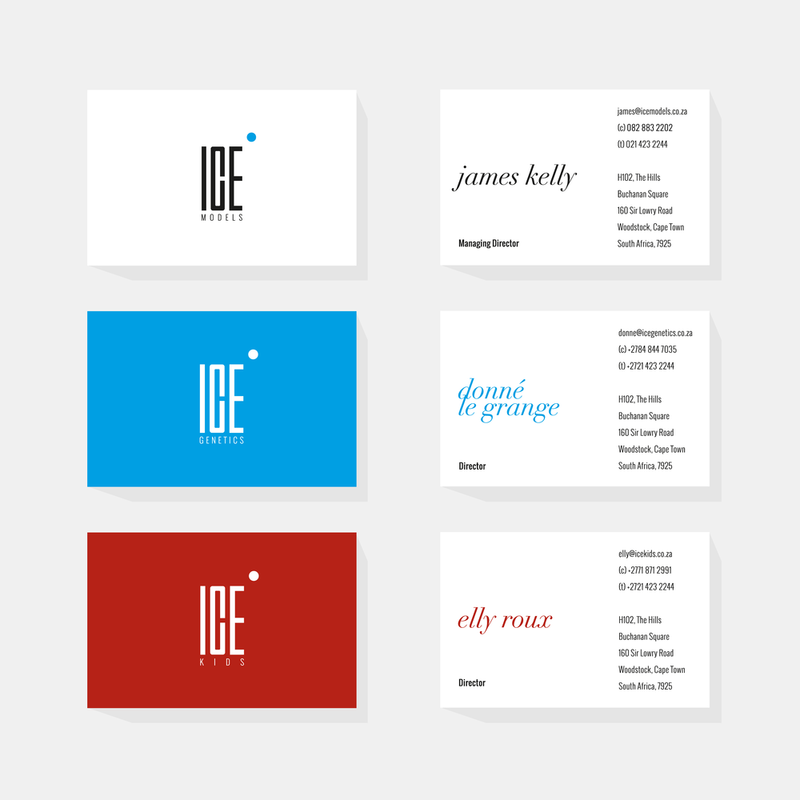 We left the longitudinal ICE typeface synonymous with the agency for 18 years untouched. For the website, we designed the landing page to pull the latest content directly from instagram and a tumblr blog to create a dynamic landing page showcasing all recent activity. The drop-downs allow the viewer to switch between divisions and regions easily. Individual model pages give the viewer the option to view the portfolio in a traditional "model book" style or in a vertical continuous scroll. Disciplines: Brand Reboot, Stationery & Promotional, Website Design / Management, Social Media Management, Content Production, Influencer Marketing.